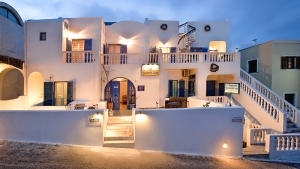 Enigma apartments & suites is located at the amazing village of Fira, the most cosmopolitan settlement of the island. 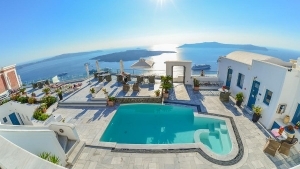 Its wonderful location provides its guests with a spectacular view of the famous Santorini volcano and Caldera, the Aegean Sea, the island’s traditional old port and, the famous Santorini sunset. 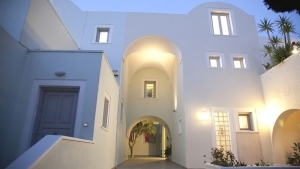 Enigma apartments & suites provides studios, apartments and suites. The studios have an open-plan design and can accommodate up to 2 persons. 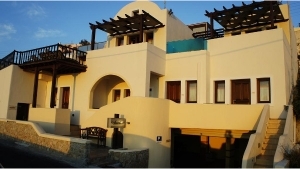 The apartments include a master bedroom and a living room with a sofa-bed and can accommodate from 2 to 4 persons. The Jacuzzi suites have 2 main sleeping areas (2 lofts or 1 bedroom and 1 loft) and a living room with a sofa-bed and can accommodate from 2 to 6 persons. Just 100 m from Enigma Apartments & Suites there is a municipal parking lot where you can park your car.